Step into an aficionado’s outdoor kitchen. inventor, passionate visionary of the grill and founder of Twin Eagles, with three decades of experience perfecting the finest culinary equipment behind his stellar reputation. Get up close and personal. You’ll appreciate the unique styling, precisely cut and shaped by our master craftspeople from the finest stainless steel. Interior designers and architects applaud the elegant lines of our premium grills, with their exquisite geometry and polished accents. You’ll love the prestigious, innovative designs – the outdoor cooking equipment you deserve, surprisingly attainable. At Twin Eagles, we listen to our dealers and customers to learn how we can make our products smarter, simpler, more efficient and fun to use. We want you, your family and friends to enjoy grilling, eating and spending time together as much as we do – making memories that linger long after the grill cools down. 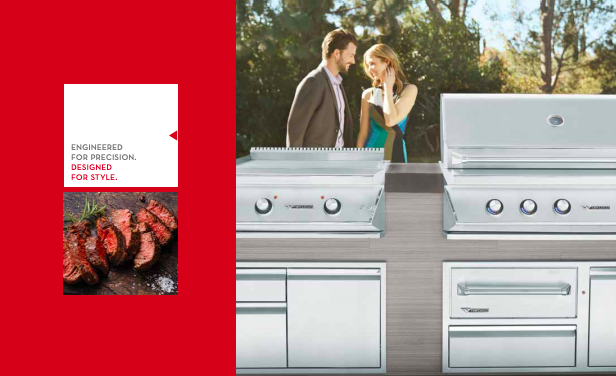 Here’s where it all comes together in our sleek, gorgeous grilling machines. 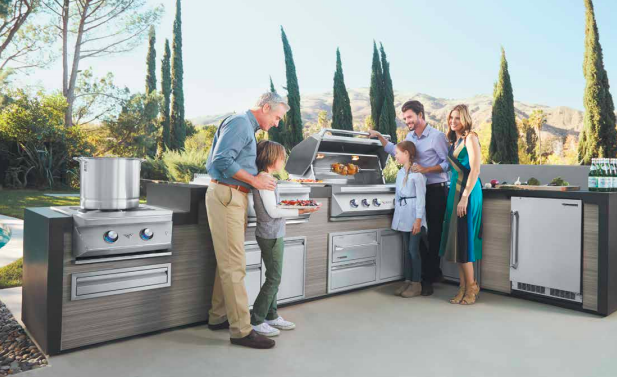 Choose one of our four built-in gas grills, depending on your preferred size and whether you want to include our finely-tuned Concealed Rotisserie System or a Sear Zone. 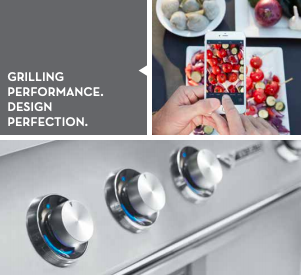 Each grill features our innovatively engineered Five-Part Grilling System, designed for the ultimate grilling synergy. decades of experience and innovation by our masters of engineering and design. unparalleled performance. it’s all in the details. Illumination features a highly visible graduated line that glows indigo blue. A control knob indicator notch illuminates to give a precise control knob setting. Reflect the exquisite design and luxurious refinements of your grill and accessories. System makes it easy for you to open and close the hood by reducing the weight load with hidden heavy-duty extension springs. Rotisserie System features a fully integrated motor with 100 lbs. turning capacity. A unique chain-driven design provides consistent and uniform rotation of the rotisserie rod and two rotisserie rod positions to keep foods the proper distance from the burner, producing exceptional results. 25,000 BTU, 14 Gauge, 304 Stainless Steel Burners & Zone Dividers. 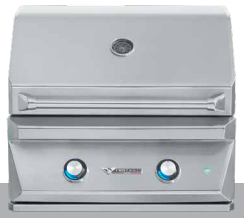 Each highperformance burner is contained to control heat independently from one grilling area to another. holds soaked hickory, mesquite, or your favorite wood chips for all you flavor mavens who crave a subtle smoky taste. 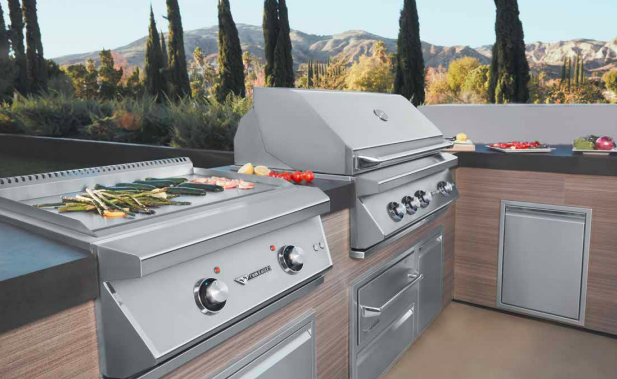 Our proprietary 5-Part Grilling System utilizes advanced technology and components designed and engineered exclusively by Twin Eagles. When you ignite the burners, heat rises and creates drafting which draws clean cool air through vents located at the bottom of the firebox. Keeps the heat above the burners, accelerating its movement to the cooking surface. Air/gas mixture remains constant for a more efficient flame. Eliminates stress to the burners from heat, the number one cause of burner fatigue. 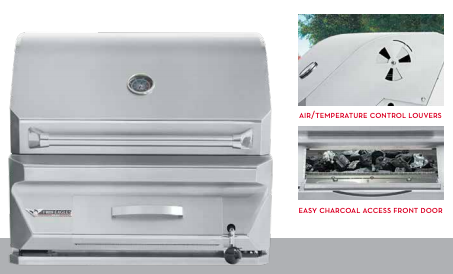 Other grill systems operate solely off the principle that heat rises, which can create hot and/or cold spots. Heat will also follow the path of least resistance. Our exclusive system uses briquette trays with channels that direct heat systematically. As the heat is pushed upward, it passes through ports located between the ceramic briquettes. Supplies the intense heat preferred for searing and grilling. High-grade ceramic briquettes distribute radiant heat evenly to the cooking surface, essential for consistent grilling. Part of the preheating process involves bringing the ceramic briquettes to temperature. Absorbing heat into the bottom of the briquettes and transferring it out the top takes time and uses gas. Instead of relying solely on absorbing heat into the bottom of the briquettes, the Twin Eagles system also absorbs heat into the sides and tops of the briquettes from channels located between the rows of briquettes. Briquettes reach temperature in a fraction of the time using less gas. The Twin Eagles grill allows you to cook multiple food items at different temperatures. A divider between each burner breaks the grilling surface into zones. You can operate all zones at the same temperature level or control each zone temperature independently. Zone grilling also permits you to grill one or two items efficiently with only one burner operating. Since drafting pushes the heat upward, it’s concentrated in one zone and will not spread throughout the firebox. Lets you effectively operate one zone only for small volume grilling. Grates on most grills serve one purpose: to hold your food. Twin Eagles grates actually aid in the grilling process by absorbing, retaining and conducting heat into your food. The thicker or heavier the grate, the more heat it will absorb and retain. We use 3/8 inch hexagonal stainless steel rods in our grates. They offer over 20% more mass than most grates and 10% more mass than 3/8 inch round rods. The increased mass retains more heat. The flat surface of the hexagon rods creates more food-tosurface contact versus round grates, allowing more heat to be conducted into your food. Creates deeper and thicker restaurant-style sear marks. We use premium-grade 300 series stainless steel, precisely cut with advanced lasers and constructed with heli-arc welding technology for the intense strength and durabilit essential for outdoor use. You’ll see and feel our commitment to quality in every interaction with our superbly engineered and crafted equipment – responsive, intuitive, easy to use. And your family and friends will taste it in every delicious bite. Sear foods faster with 25,000 BTUs of direct, intense infrared heat to seal in natural juices, for moister, more flavorful foods. You can choose to include a Sear Zone on our 30”, 36” and 42” grills. Standard on the 54”. Our innovative rotisserie features a fully integrated rotisserie motor with 100 lbs. turning capacity. A unique chain-driven design provides consistent and uniform rotation of the rotisserie rod. Two rotisserie rod positions keep foods the proper distance from the infrared burner, producing exceptional rotisserie cooked foods. 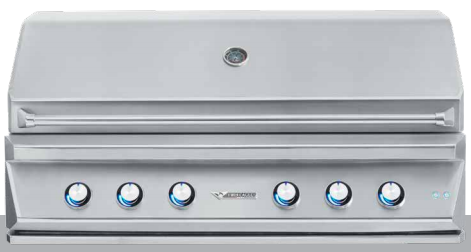 You can choose to include a Concealed Rotisserie System on our 30”, 36” and 42” grills. Standard on the 54”. For backyard barbecue mavens who like to entertain big and juggle several grilled foods at once, your dream machine has arrived.